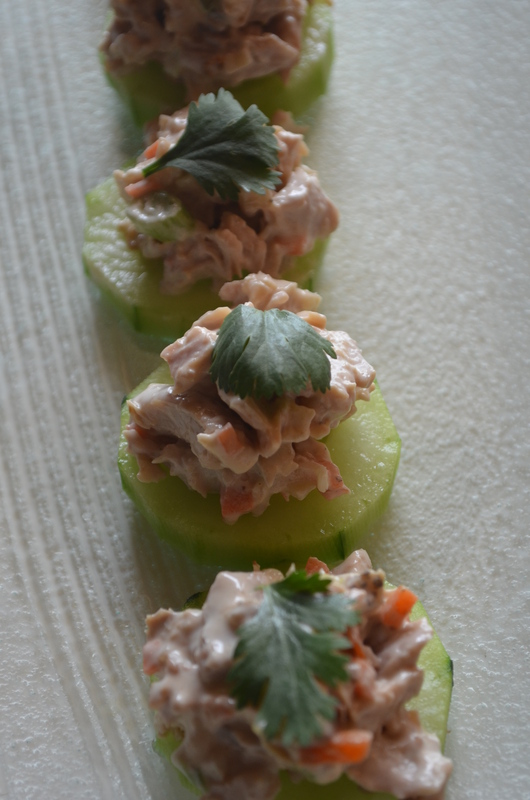 I love, love, love chicken salad and am constantly creating different versions. My top three recipes are this one, my rosemary chicken salad and my curried chicken salad. My Asian version always wows people and I think it’s because it’s so unique. I love it because it’s easy, delicious and I can serve it three ways. And I have served it on French bread as a sandwich and that’s pretty fantastic, too. I recommend topping the sandwich with thinly sliced cucumbers. Every version is fantastic. In my recipe, I recommend using celery OR water chestnuts. I prefer celery but have made it both ways. They key to this salad is you must have Soy Vay Veri Veri Teriyaki sauce. If you’ve never used that sauce, you should. It’s one of my favorite kitchen condiments. You can search stores in your area on the website to see if they carry it. This salad is perfect for entertaining or enjoying at home. Take it on a picnic or out on the boat. It’s lovely. Enjoy. Dark meat is great in this dish, so if you’re not crazy about legs and thighs, try adding the meat to this. It makes a wonderful appetizer. A buttery Ritz is a wonderful complement, or serve it on a slice of cucumber when it’s hot outside for a refreshing appetizer. While I am not an iceberg lettuce fan, if you are serving this on lettuce, iceberg is the way to go. It’s so crisp and light and is a beautiful compliment to the salad. 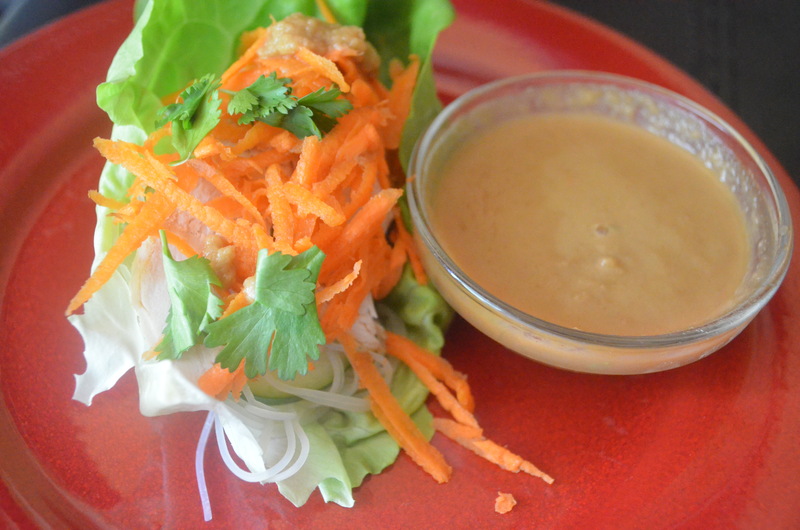 In a large bow, mix mayonnaise and Soy Vay sauce together. Then add chicken, celery or water chestnuts, onion and cilantro. Stir until thoroughly combined. Add pepper to taste. If serving as a salad, serve it over lettuce with cucumbers and topped with carrots. In serving for a party, you an sit it out surrounded by crackers or plate each individual cracker. Cucumber slices are a nice addition if it’s self serve. You an also use cucumber slices to serve the salad if you are avoiding extra carbs. You can garnish with extra cilantro, if desired. I did it more for aesthetics for the photo. 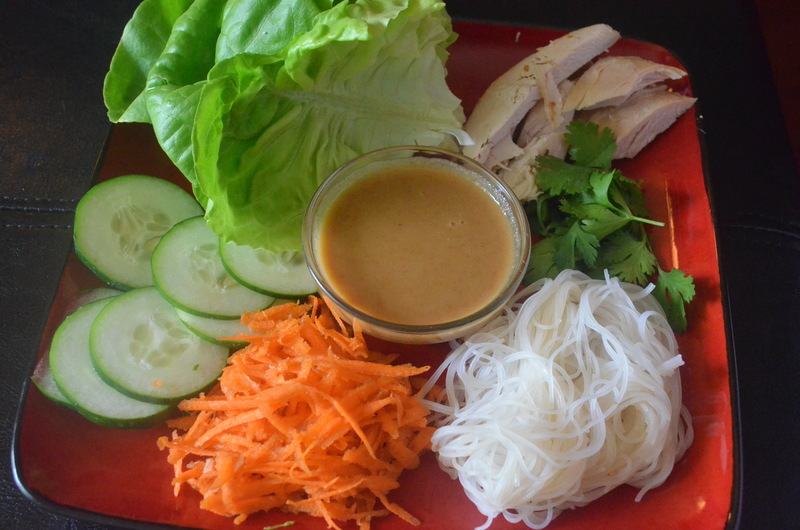 This entry was posted in Appetizers, Salad, Sandwiches and tagged asian, chicken salad, cilantro, delicious, easy, Entertaining, fast, fusion, green onions, lunch, Party, picnic, rotisserie chicken, salad, sandwich, simple, Soy Vay sauce, spring, summer on April 18, 2015 by Juliana Goodwin. 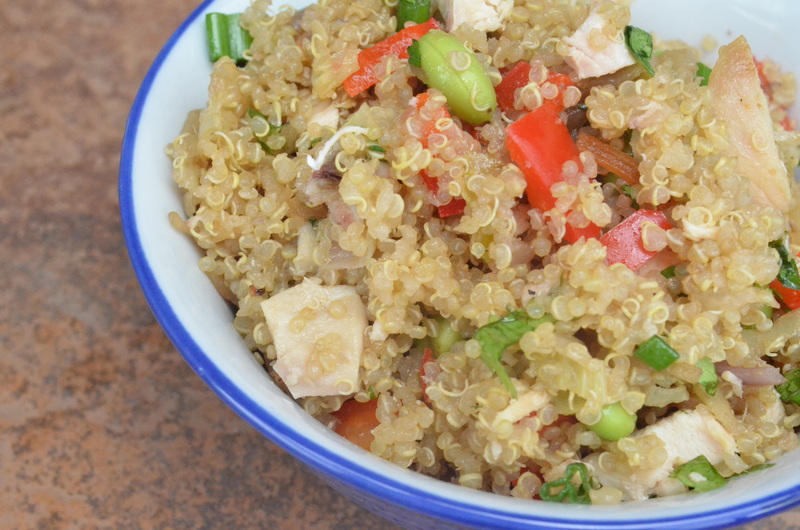 This dish is packed with protein from three sources: quinoa, chicken and edamame. It’s a light dish and has vitamin C, antioxidants, B vitamins, fiber and more. .This makes a large batch, so you can enjoy it for several days. It’s so easy to pack for lunch and leftovers are great cold. I actually prefer it cold. You can use any combination of stir-fried vegetables, like broccoli. I sometimes toss that in if I have takeout leftovers. I personally love ginger, so I’d prefer twice as much ginger, but to tame it for everyone else, I use this amount. If you love ginger, you can add more, too. For the dressing: whisk all ingredients together and set aside. For the quinoa, in a medium to large pot with a tight fitting lid, bring broth, ginger paste and quinoa to a boil for 3 minutes, then cover and reduce heat to low for 15 minutes. You will know quinoa is done when the grain releases what looks like a little hook. If it’s not done after 15 minutes, cover and cook another 5. While that cooks, slice roots off green onions and thinly slice the rest of the onions and set aside. Chop red bell pepper and set aside. Grab your bundle of cilantro and chop the leaves. Next, in a large frying pan, heat canola oil over medium-high heat. When hot, add onion and cole slaw mix and cook 7 minutes. Add red bell pepper and stir fry 3 minutes. Then add soy sauce and pepper to taste. Debone and de-skin your chicken and chop it into small cubes. By now, quinoa should be done. Transfer it to a large bowl. Add edamame, cabbage mixture, cilantro and chopped chicken. Toss with the dressing and serve. 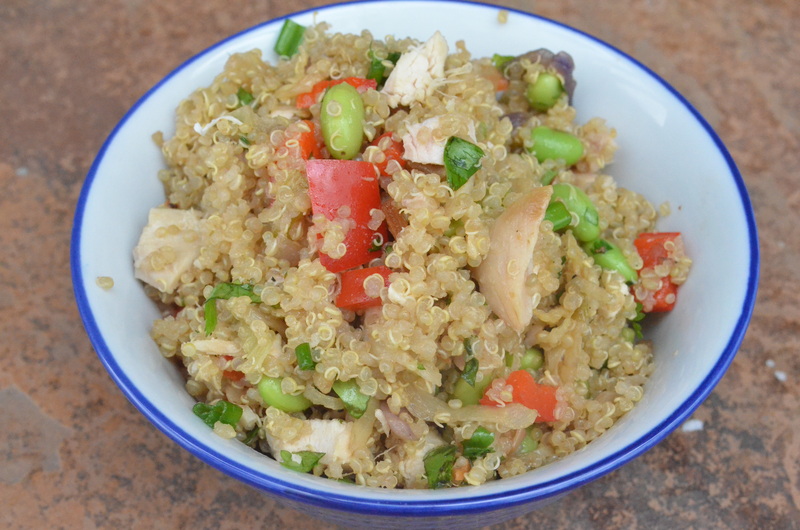 This entry was posted in Main Courses and tagged asian, cabbage, cilantro, dinner, edamame, ginger, leftovers, lunch, quinoa, rotisserie chicken, soy sauce on April 2, 2015 by Juliana Goodwin. First, spring signals asparagus season. Asparagus is very high in vitamin K (almost all you need for the day); and is good source of potassium, fiber, vitamin B6, vitamins A and C, and thiamin. When buying asparagus, the first signs of spoilage can be found at the tips. If the tips are browning, slimy or even opening, don’t buy it. Fresh asparagus have tightly closed tips. Also, look at the ends and avoid stems that are limp, or ridged, as ridged stems is a sign the sugar is converting into carbohydrates and the stalks will be tough and woody. Spears can range in size from fat to thin, but it’s best to pick spears that are as uniform as possible in one bunch so they cook evenly. I usually opt for thinner asparagus because it’s a sign the plant was harvested earlier and is potentially tenderer. However, bigger is better when you’re wrapping the asparagus in bacon or prosciutto because it’s easier to handle. Also, it depends on the thickness of the stalks, but a pound has roughly 20-26 asparagus, so if you are wrapping it that will help you factor in how much meat you need, too. 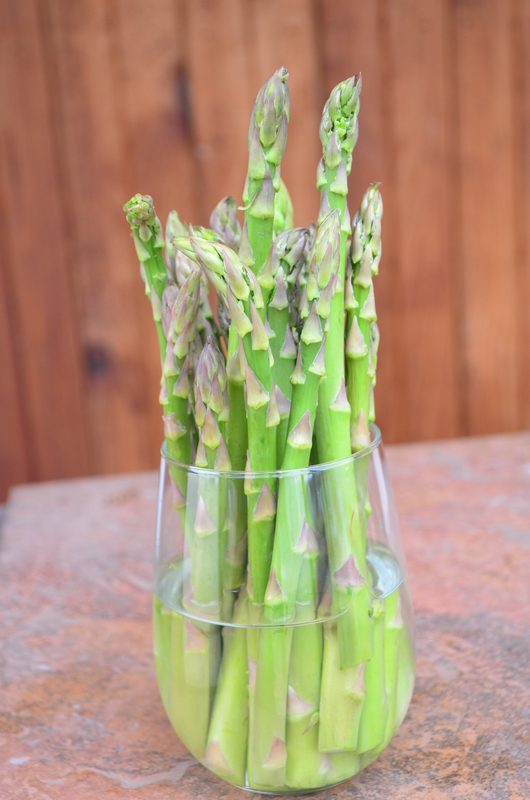 The best way to store asparagus, is to slice off the bottoms and place the stalks in a glass with 1-inch of water. Loosely cover with a plastic bag and refrigerate. Note: the pepper is strong in this dish, if you’re serving it to small children, you might want to cut the pepper in half. Put a large pot of water on to boil and salt the water. Make the sauce by whisking together all sauce ingredients and set aside. Slice the tough ends off asparagus and discard. Then cut the remaining asparagus into 1-inch pieces. Remove stems from the shiitake mushrooms and slice the tender mushroom heads. Note, the stems are tough but can be reserved for making stock as the stems are tough but add rich flavor to stock or soup. In a large skillet, large enough that you will be able to add the rice noodles later, heat 1 teaspoon canola oil. When hot, add onion and cook 3 minutes. Then add asparagus and mushrooms and cook 7 minutes. In the last minute, add 1 teaspoon soy sauce and chicken. 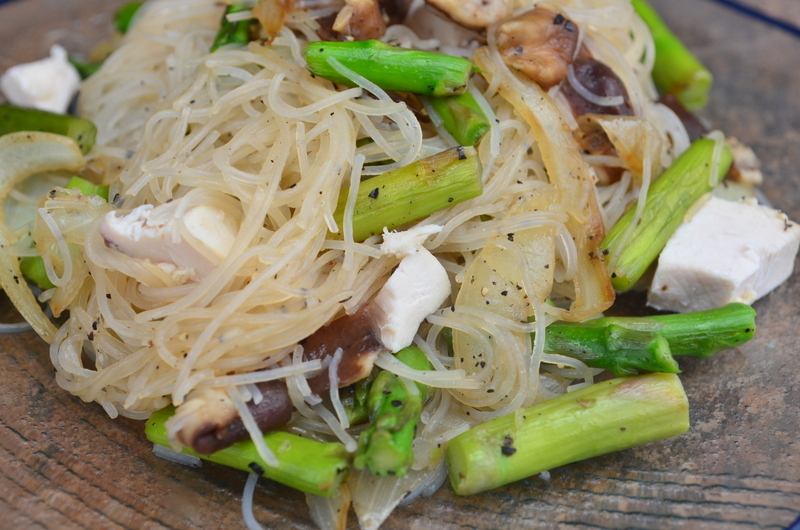 This entry was posted in Main Courses, Pasta and tagged asian, asparagus, easy, lunch, quick dinner, rice noodles, rotisserie chicken, sesame, shiitake mushrooms on March 12, 2015 by Juliana Goodwin.